When you first think about it, doors may not carry much weight. They are simply upright slabs of some material that slow your progress in and out of buildings. But when you stop and think about the symbolism of your doors, what they mean, and what they mean to others, your door suddenly becomes so much more mysterious. At Entry Brite, we think about the messages our stained glass front doors convey every time we custom make one for our clients in Phoenix. 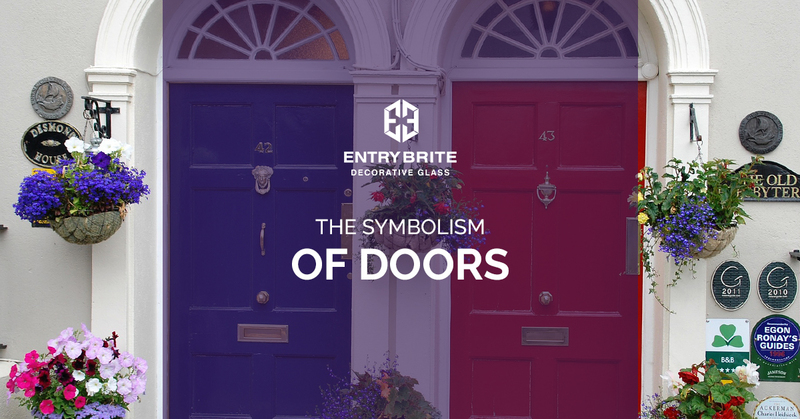 In today’s blog, we consolidated some of these ideas and presented some of the most interesting symbols that doors represent. Duality is the idea of contrast, that there are two somethings that are in opposition with the other. Light and dark, left and right, up and down. There are hundreds of examples of duality in our everyday life, including the doors we walk through every day. Doors are a physical manifestation of the symbol of duality: they can be open or closed, an invitation or a barrier, locked and unlocked. You can also think about the dualism that a stained glass front door introduces to your entryway. Your door seals your home from the outside world, but the glass allows light in. We’ve often heard the phrase “when one door closes another door opens.” Made famous by the famed inventor of the telephone, Alexander Graham Bell, this phrase captures the idea that doors can signal the beginning and ending of something. We see this in countless movies, where characters burst through doors enthusiastically, ready to take on a new challenge. Similarly, we see other characters have doors slammed shut in their face, drawing a moment or event to a close. Technically part of a door frame, the threshold holds specialize symbolic weight in our culture, and in cultures across time. Famously, in telling hero stories, the hero’s first move is to cross the threshold. While not literally in all cases, this metaphorical crossing of the threshold is the first time the hero faces a challenge and succeeds, knowing that they cannot return to the life they had lived. In modern culture, there is significance in marriages for one partner to carry the other over the threshold into their home. Similarly, this entrance through a doorway signals the start of a new life together. Literature and film use the idea of the locked door as an obvious symbol of something forbidden. A locked door presents the viewer or reader with a sense of mystery that they share with the protagonist of the story. Just what lies behind that door? Naturally, the door, and the mystery, cannot be unlocked until the protagonist has completed some action or task, even if that is just finding the key. A locked door fills us with wonder and desire. It creates a fascination with the taboo, as the lock keeps us from something, even if we don’t know why we are being kept from it. Your front door can communicate many of these symbols. They serve as the first barrier to entry into your home. If you want your door to symbolize ideas of openness, warmth, and hospitality, you can achieve that by adding a custom-made stained glass window to your front door. 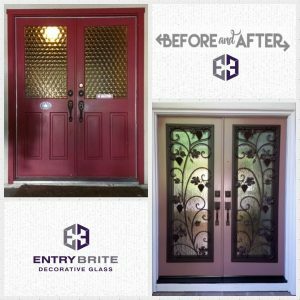 Entry Brite can use brilliant colors and shades, as well as textured glass to complete reimagine your door, and the symbols it conveys. Find out more on our gallery page and contact us today to order your stained glass front door for your Phoenix home!